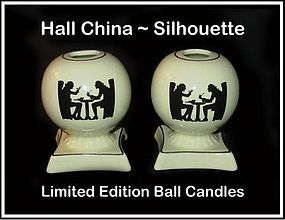 These ball shaped candles with the square base were a limited edition made by Hall China in the early 1990's. They were not made by Hall in the original Cook Coffee list. They are in excellent condition! The have the Taverne Silhouette pattern on them.